Hampshire Plant & Access (HPA) part of the AFI group of companies has purchased over £500k of JCB machines in the latest boost to their fleet. Six JCB excavators, ranging from the 8026 micro-excavator through to the JCB 131 14 ton machine. HPA have purchased over £500k of JCB machines from Greenshields so far in 2018. In addition to the compact excavators and site dumpers, two JS 131 tracked excavators have also been added to their fleet. Designed specifically for the rental sector, the 13 tonne JS 131, is the only excavator in this weight category that doesn’t require DPF, SCR or AdBlue thanks to its 55kW JCB Ecomax engine. It is robustly designed to withstand the treatment that rental machines can be subjected to on-site, yet delivers excellent productivity, comfort and safety. The JCB machines have been supplied from Greenshields JCB HQ in Farnham, Surrey. 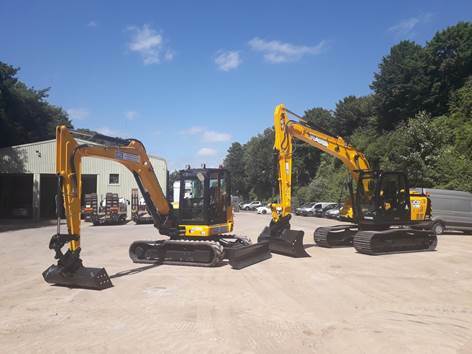 Other machines supplied this year include the JCB 8008, JCB 8026, JCB 57C and JCB 86C from the Compact Excavator Range, plus JCB 1T and JCB 9T site dumpers.